GPS - Parking area - trail start, 270 meter el. 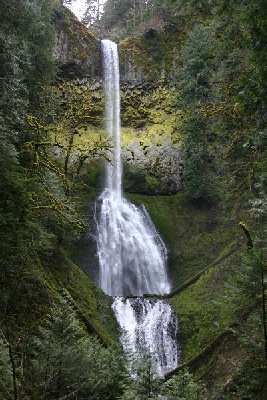 Pup Creek Falls is south of Mt. Hood. Or, from Woodburn head northeast on HWY 211 and follow all signs for Estacada. At junction of 211 and 224 in Estacada continue southeast on HWY 224 (Clackamas River). After milepost 39 and just across a bridge turn right onto Fish Creek Road (#54). In 0.25 miles park at the rest area (Northwest Forest Pass required). At the end of the parking area cross the road and start up Trail 715. Trail is about 3 miles distance with lots of ups and downs. As you approach Pup Creek you'll find a panorama shown below. the marker you'll encounter Pup Creek. Head back and find the marker. 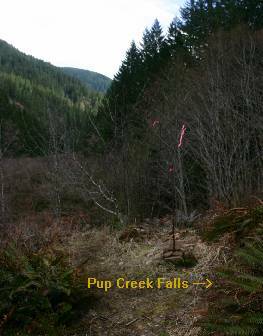 Distance from the marker to Pup Creek Falls is about 0.1 mile. I was unable to get a GPS at the actual waterfall. Below is the panoramic of the junction. See the colored stick and the limbs with colored ribbon?